When choosing a cloud to host your applications, you want a portfolio of database options—SQL, NoSQL, relational, non-relational, scale up/down, scale in/out, you name it—so you can use the right tool for the job. Google Cloud Platform (GCP) offers a full complement of managed database services to address a variety of workload needs, and of course, you can run your own database in Google Compute Engine or Kubernetes Engine if you prefer. Today, we’re introducing some new database features along with partnerships, beta news and other improvements that can help you get the most out of your databases for your business. Until now, it's been a challenge for customers to bring some of the most common workloads to GCP. Today, we’re excited to announce that we are partnering with managed service providers (MSPs) to provide a fully managed service for Oracle workloads for GCP customers. Partner-managed services like this unlock the ability to run Oracle workloads and take advantage of the rest of the GCP platform. You can run your Oracle workloads on dedicated hardware and you can connect the applications you’re running on GCP. By partnering with a trusted managed service provider, we can offer fully managed services for Oracle workloads with the same advantages as GCP services. You can select the offering that meets your requirements, as well as use your existing investment in Oracle software licenses. We are excited to open the doors to customers and partners whose technical requirements do not fit neatly into the public cloud. By working with partners, you’ll have the option to move these workloads to GCP and take advantage of the benefits of not having to manage hardware and software. Learn more about managing your Oracle workloads with Google partners, available this fall. This week we announced our collaboration with Intel and SAP to offer Compute Engine virtual machines backed by the upcoming Intel Optane DC Persistent Memory for SAP HANA workloads. Google Compute Engine VMs with this Intel Optane DC persistent memory will offer higher overall memory capacity and lower cost compared to instances with only dynamic random-access memory (DRAM). Google Cloud instances on Intel Optane DC Persistent Memory for SAP HANA and other in-memory database workloads will soon be available through an early access program. To learn more, sign up here. We’re also continuing to scale our instance size roadmap for SAP HANA production workloads. With 4TB machine types now in general availability, we’re working on new virtual machines that support 12TB of memory by next summer, and 18TB of memory by the end of 2019. For app developers, Cloud Firestore brings the ability to easily store and sync app data at global scale. Today, we're announcing that we’ll soon expand the availability of the Cloud Firestore beta to more users by bringing the UI to the GCP console. Cloud Firestore is a serverless, NoSQL document database that simplifies storing, syncing and querying data for your cloud-native apps at global scale. Its client libraries provide live synchronization and offline support, while its security features and integrations with Firebase and GCP accelerate building truly serverless apps. We're also announcing that Cloud Firestore will support Datastore Mode in the coming weeks. Cloud Firestore, currently available in beta, is the next generation of Cloud Datastore, and offers compatibility with the Datastore API and existing client libraries. With the newly introduced Datastore mode on Cloud Firestore, you don’t need to make any changes to your existing Datastore apps to take advantage of the added benefits of Cloud Firestore. After general availability of Cloud Firestore, we will transparently live-migrate your apps to the Cloud Firestore backend, and you’ll see better performance right away, for the same pricing you have now, with the added benefit of always being strongly consistent. It’ll be a simple, no-downtime upgrade. Read more here about Cloud Firestore. For your analytical and operational workloads, an excellent option is Google Cloud Bigtable, a high-throughput, low-latency, and massively scalable NoSQL database. Today, we are announcing that regional replication is generally available. You can easily replicate your Cloud Bigtable data set asynchronously across zones within a GCP region, for additional read throughput, higher durability and resilience in the face of zonal failures. Get more information about regional replication for Cloud Bigtable. Additionally, we are announcing the beta version of Key Visualizer, a visualization tool for Cloud Bigtable key access patterns. Key Visualizer helps debug performance issues due to unbalanced access patterns across the key space, or single rows that are too large or receiving too much read or write activity. With Key Visualizer, you get a heat map visualization of access patterns over time, along with the ability to zoom into specific key or time ranges, or select a specific row to find the full row key ID that's responsible for a hotspot. Key Visualizer is automatically enabled for Cloud Bigtable clusters with sufficient data or activity, and does not affect Cloud Bigtable cluster performance. Learn more about using Key Visualizer on our website. 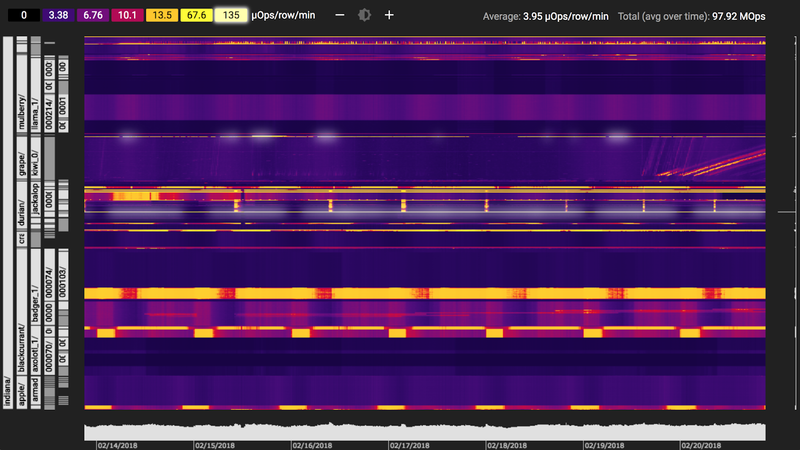 Key Visualizer, now in beta, shows an access pattern heat map so you can debug performance issues in Cloud Bigtable. Finally, we launched client libraries for Node.js (beta) and C# (beta) this month. We will continue working to provide stronger language support for Cloud Bigtable, and look forward to launching Python (beta), C++ (beta), native Java (beta), Ruby (alpha) and PHP (alpha) client libraries in the coming months. Learn more about Cloud Bigtable client libraries. Last year, we launched our Cloud Spanner database, and we’ve already seen customers do proof-of-concept trials and deploy business-critical apps to take advantage of Cloud Spanner’s benefits, which include simplified database administration and management, strong global consistency, and industry-leading SLAs. Today we’re announcing a number of new updates to Cloud Spanner that our customers have requested. First, we recently announced the general availability of import/export functionality. With this new feature, you can move your data using Apache Avro files, which are transferred with our recently released Apache Beam-based Cloud Dataflow connector. This feature makes Cloud Spanner easier to use for a number of important use cases such as disaster recovery, analytics ingestion, testing and more. We are also previewing data manipulation language (DML) for Cloud Spanner to make it easier to reuse existing code and tool chains. In addition, you’ll see introspection improvements with Top-N Query Statistics support to help database admins tune performance. DML (in the API as well as in the JDBC driver), and Top-N Query Stats will be released for Cloud Spanner later this year. Your cloud data is essential to whatever type of app you’re building with GCP. You’ve now got more options than ever when picking the database to power your business.